The central themes of this book are 1) the diverse functions of language, 2) the role of models, and 3) the role of paradigms. Barbour uses the word myth in the title to reflect only one of the functions of language, referring to myths as those "stories which are taken to manifest some aspect of the cosmic order," but he also focuses on linguistic analysis - how we use different types of language in science, art, ethics, religion, etc. [page 5] The function of scientific language is the prediction and control of nature; that of religious language is the expression of self-commitment, ethical dedication, and existential life-orientation. But the price of this division of labour is that religion would have to give up any claims to truth, at least with respect to any facts external to one's own orientation. Models, as Barbour defines them, are "imaginative tools for ordering experience, rather than a description of the world." If one has a model then one has a process for operating on their experience of the world. Theoretical models in science are mental constructs whose purpose is to account for the observed phenomena in the external world. Models in religion are similar constructs that people use to account for the observed phenomena in the inner world of human experience. Paradigms, up until 1962 and Thomas Kuhn's Structure of Scientific Revolutions, were identical to models as defined above. Singlehandedly, or rather single-bookedly, Kuhn moved the recondite word paradigm from the back shelf of obscurity to the forefront of modern jargon. Barbour was writing this book less than a dozen years after Kuhn's book came out, so the concept was very new to him. What Kuhn did was to greatly expand the concept of model to embrace the entire field of science with his definition of paradigms as "standard examples of scientific work that embody a set of conceptual, methodological and metaphysical assumptions." [pages 8-9] In the second edition (1970) of Kuhn's book and in subsequent essays, he distinguished several features which he had previously lumped together: a research tradition, the key historical examples ('exemplars') through which the tradition is transmitted, and the set of metaphysical assumptions implicit in its fundamental conceptual categories. Adopting these distinctions, I will use the term paradigm to refer to a tradition transmitted through historical exemplars. The important part comes in the implications of the concept of paradigms for religion. By the 1960s and Kuhn's work, scientists began to accept that theory has an influence on observation. Science could not longer make the claim of theory-independent observations as making it superior to religion. Previously it was claimed by scientific empiricists that a theory could be falsified by disagreement with data. What Kuhn pointed out was that this seldom happened in practice in scientific work. Instead, when discordant data was found the assumptions were either modified to include them or the bad data were set aside as anomalies of no importance. In the absence of an alternative theory, the bad data was ignored. Thus Anthony Flew's requirement that falsifying conditions for religious beliefs should be specified became unreasonable as they were not specifiable for comprehensive scientific theories. The final blow that overturned the belief that scientific choices were rational, objective and in accordance with specifiable criteria was Kuhn's claim that the criteria for judging theories themselves are paradigm-dependent! "He described the change of paradigms during a 'scientific revolution' as a matter not of logical argument but of persuasion and 'conversion.'" One can easily tell that scientific beliefs have become, after Kuhn, things much more alike religious beliefs than ever before! What is a metaphor? Is it an analog between the normal context of a word and some new context that is offered? A juxtaposition between the two contexts or frames of reference? Is it just a shortened simile? A word that can be replaced by a series of equivalent literal statements? Yes, and even more is the only answer one can give. Here's Ian Barbour's comprehensive view of metaphor. [page 14] A metaphor cannot be replaced by a set of equivalent literal statements because it is open-ended. No limits can be set as to how far the comparison might be extended; it cannot be paraphrased because it has an unspecifiable number of potentialities for articulation. Symbols are a form of metaphor that we are all familiar with. Paul Tillich once wrote, "a religious symbol is idolatrous unless it suggests its own inadequacy." This is a sentence worth pondering and meditating on. It calls to my mind what Groucho Marx wrote back to the Board of Directors of the prestigious Friar's Club in Hollywood in response to an invitation for him to become a member, "I would not join a club that would have me as a member." What is the similarity of these two thoughts? Raised as a Catholic, I became aware at an early age of the claims of other religions that Catholics worshiped idols in their churches, referring of course to the statues of saints, Mary, and other holy people that line the walls of a typical church. What those criticizing religions missed was that the statues were merely symbols to remind us of the holy person in our thoughts as we stood before the statue in prayer. Tillich had it right. So did Groucho. 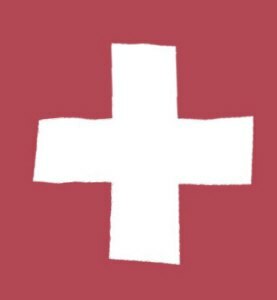 Unless the symbol is more than it appears to be, it is idolatrous. Groucho was expressing the impossibility of some person of low estate raising his worth in the eyes of the world simply by joining a fancy club. The Friar's Club as a symbol of prestige is idolatrous if mere membership is able to bestow prestige upon one. Barbour goes on to discuss parables as metaphor or similes "drawn from nature or common life, arresting the hearer by its vividness or strangeness, and leaving the mind in sufficient doubt about its precise application to tease it into active thought." (C. H. Dodd quote on page 17) Following the lead of Richard Bandler, I choose to blur the distinction of parable and metaphor and call them both metaphor. Christ Jesus was famous for His parables or metaphors. They teased the common people into thought. He explained as much to His disciples, saying that common people were not accustomed to deep thought as the disciples were, so He gave them parables to chew on. One of the finest metaphors on this subject, I read in Hazrat Inayat Khan's writings. He was seated at a table near a bowl of peaches and one of his disciples asked for a peach. Hazrat took the peach, ate off its flesh and handed the bare pit to his disciple. When one tells a parable or a metaphor in the form of a story, it is like that plump peach, lots to chew on surrounding the pit. If one then proceeds to explain what the parable or metaphor means, one has eaten the flesh and robbed the hearer of vital nutrition. The point of a story is like the pit of the peach. One has to plant it and wait a very long time for a tree to sprout and bear peaches before any nourishment will come. The peach can provide instant nutrition as the listener begins to chew upon and digest the meaning of the parable or metaphor. Please excuse me for my gauche behavior in explaining this point, but stick around the next one won't be stripped bare, most likely. [page 20-21] 1. Myths offer ways of ordering experience. 2. Myths inform man about himself. 3. Myths express a saving power in human life. 4. Myths provide patterns for human action. 5. Myths are enacted in rituals. 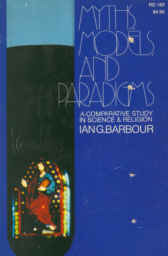 With this much background, you can tell if you wish to read the book and to see for yourself how Barbour relates the three themes of myths, models, and paradigms to the disparate fields of science and religion, and makes good sense out of them without eating away all the flesh of the fruit he hands us in this book.